Facebook Emoji are little icons which can be added to Facebook comments and chat. 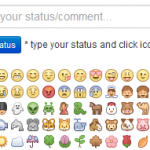 They are similar to Facebook smileys only there is no easy way to add them to status. That’s why we created this Emoji maker. Just click Emojis you like and copy shortcut to Facebook. Click the Emojis below and their shortcuts will show up here. You can also write some text, Emojis will be added to text. This icons will work for all Facebook users (they don’t need to download any app). how to down load it?